A group of 2010-2011 Rome Prize Winners at the American Academy in Rome Award Ceremony on April 15 in New York. NEW YORK, NY.- The American Academy in Rome announced the winners of the 2010-2011 Rome Prize. Recipients of the 114th annual Rome Prize Competition are provided with a fellowship that includes a stipend, a study or studio, and room and board for a period of six months to two years in Rome, Italy. 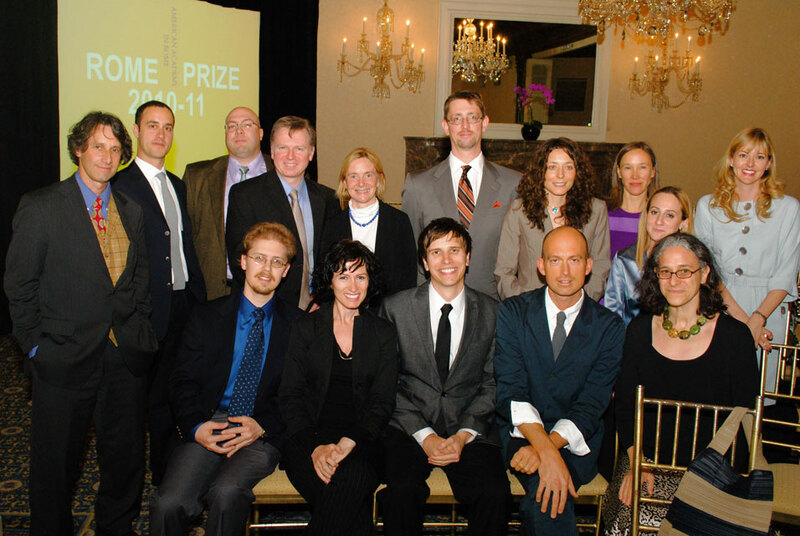 The 2010-2011 Rome Prize winners are Seth G. Bernard, M. Shane Bjornlie, Dike Blair, Casey Lance Brown, Thomas J. Campanella, Felipe Dulzaides, Holly Flora, Fritz Haeg, Huck Hodge, Stephanie Malia Hom, Jay Hopler, Lauren M. Kinnee, Ersela Kripa, John Matteo, Heather McGowan, Jeremy Mende, Kathryn Blair Moore, Stephen Mueller, Stephanie Nadalo, Barbara Naddeo, Sarah Oppenheimer, Mark Rabinowitz, Andrew M. Riggsby, Elizabeth C. Robinson, Paul Rudy, Laurie W. Rush, Jennifer Scappettone, Joshua G. Stein, Carly Jane Steinborn, Tyler T. Travillian, Adrian Van Allen, Michael J. Waters, and Karen Yasinsky. Each year, through a national competition, the Rome Prize is awarded to approximately thirty individuals working in Ancient, Medieval, Renaissance and Early Modern, or Modern Italian Studies, and Architecture, Landscape Architecture, Design, Historic Preservation and Conservation, Literature, Musical Composition, or Visual Art. Forty-eight individuals were invited to make up nine peer juries to review the applications this year. The application deadline is November 1st.